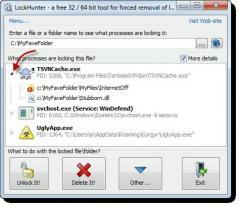 LockHunter is a simple piece of software that helps you work with files that have been locked by other users. The program allows you to unlock these files, but also to remove, rename or move them to a different location on your hard drive. The program integrates with Windows Explorer so you can quickly choose a locked file from the context menu. All you need to do is right-click on the file and it will automatically be scanned to determine if it’s locked or not. In LockHunter’s simple interface you can unlock the selected file, remove it at the next system reboot, delete it, unlock it and rename the items, but also move it to a different location. You can also terminate all programs that are launched from the selected file, use command-line functions or delete the locking processes from the hard drive.